Nalle working Humildes pa casa, 8c. Photo from Nalles blog. 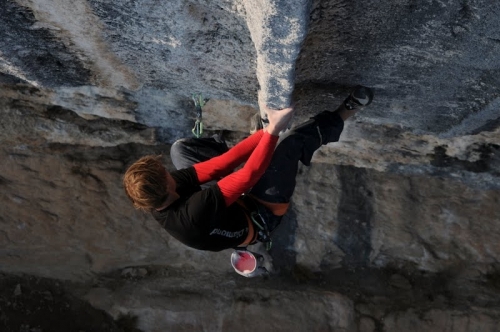 A couple of days ago I was going through my RSS-feeds and saw a new post by Nalle Hukkataival, the strong Finish boulderer with FA up to 8C. Now he is visiting Catalonia in northern Spain and trying to build some stamina for the long routes of Oliana. He writes “Humildes pa casa, the best tufa in Spain!” and I must say it looks amazing! I googled a bit more and found a beautiful photo of the route and a video of Sharma climbing it on-sight… I understand that the route is 50 meters long with the tufa being the last 25 meters. Crazy, just crazy. OK, I think I will just have to realize that I will never climb this route but just looking at the photos makes me want to pack my rope, draws and shoes and head to the nearest cliff. The Oliana-area is a really nice place to climb even for us mere mortals, as I wrote in an earlier post. We also have a really nice place to stay for all of you considering heading this way, Cal Rafeló. Tagged with alt urgell, tufa, Video.